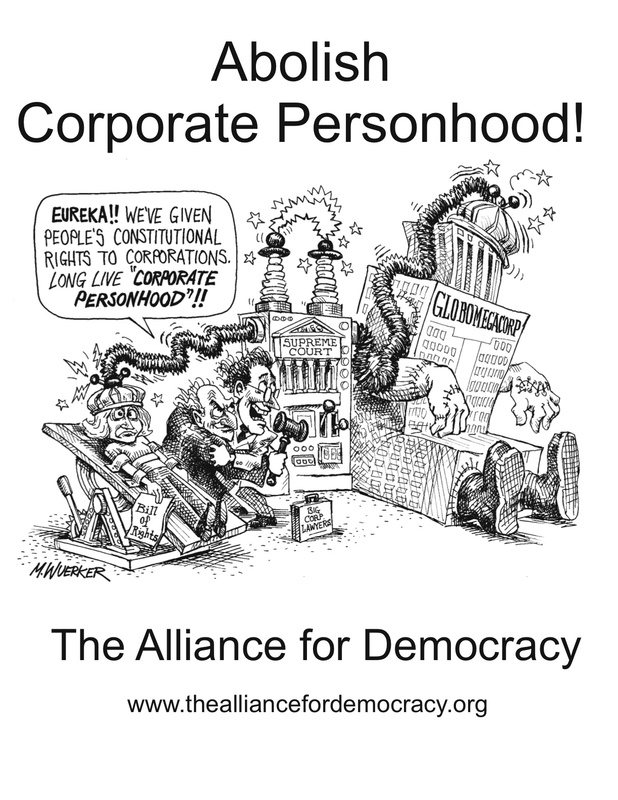 The Alliance For Democracy - News, eNewsletters, Alerts and Chapter News: Anti-corporate crafting: a strong message on a cool medium! Anti-corporate crafting: a strong message on a cool medium! Here's what the back of the shirt looks like! Well, now it can be yours, with a little work, a plain light-colored shirt (or tote bag or banner), and a couple of those iron-on transfer sheets that you can run through your printer at home. Just print out these two pdf files, t-shirt front, and t-shirt back for an Alliance for Democracy shirt. In order to transfer "right-side-to" onto a t-shirt, you'll have to print these two mirror-image files of the final artwork and slogan. You can find the transfers online, or at local craft or office supply stores. Use an ink-jet printer to print, and a regular iron to transfer to your fabric. The transfer sheets also come with good instructions. To get a better idea of the artwork or to print out "right-side-to" files for a poster, use these files: the famous quote by Bill Meyers, in the public domain, and the famous cartoon by Matt Wuerker, which was drawn and given by the artist to the original Women's International League for Peace and Freedom campaign to "Challenge Corporate Power--Assert the People's Rights" in 2001. 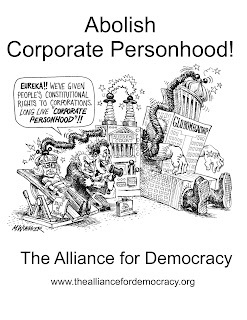 Thanks to Jan Edwards for updating this classic for the current campaign against corporate personhood, and thanks to you in advance for using a fair-trade or union-made shirt as you stay cool this summer and show your support for human persons.